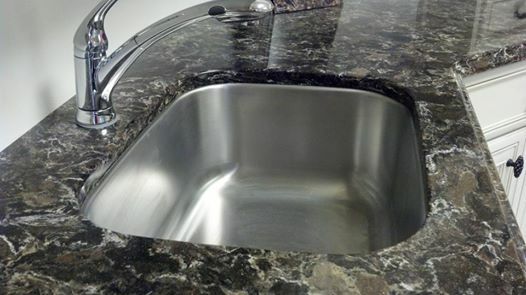 This beautiful countertop was installed in conjunction with our Chattanooga location of Granite Countertop Warehouse, and features Laneshaw quartz by Cambria with an undermount sink. This quartz color is named for a centuries-old village in England. The color consists of a black base with brown and beige veins. Subtle white and a gold shimmer adds an unexpected twist that gives a glamorous touch. Cambria is a natural quartz product that has a variety of uses in your home or business such as countertops, floor tile, vanities, fireplace surrounds, wet bars, showers, etc. Quartz is a natural product and one of the hardest minerals on Earth. Some of Cambria’s designs have the natural look and feel of granite, marble and other quarried stones, but without the upkeep and maintenance requirements. To speak to an expert about Cambria quartz for your home or business in the metro Atlanta area, call 678.809.5188 or make an appointment.